Directorate of Elementary Education (DEE), Assam published notification for recruitment for 6027 Teachers in Lower Primary School, Assistant Teacher, Science Teacher, Hindi Teacher, Arabic Teacher. View more information about recruitment for e.g. educational qualification, selection process, age limit, application fees, how to apply, important dates, important links all are as under. Educational qualification: 50%in Higher Secondary(orits equivalent)with LPTE Tand 2-Year Diploma in Elementary Education from recognized institutes. Pay Band II and UPTET. Educational qualification: B.Sc. degree from the UGC recognized University and UP TET qualified in Science and Mathematics Stream. Educational qualification: Graduate degree from the UGC recognized University having Hindi as one of the subjects and UP TET. Educational qualification: Graduate degree from the UGC recognized University having Arabic as one of the subjects and UP TET. 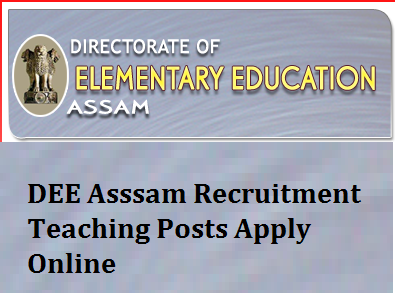 Application fee: Rs 200 for General/OBC and Rs 150 for ST/SC though IPO (Indian Postal Order) in favour "Director of Elementary Education, Assam"